The 7 Best Buffets in West Virginia! 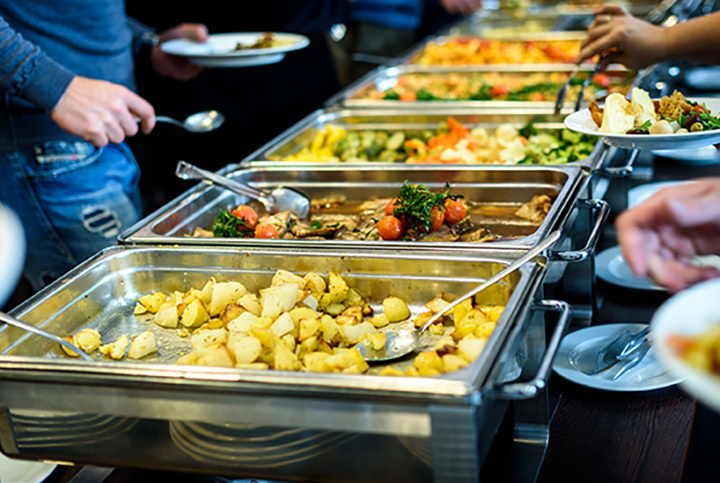 Whether you’re into traditional American favorites or want to try something from another country, buffets give you the chance to sample items without ordering a large portion. These seven best buffets located around the Mountain State offer lunch and dinner buffets with a variety of selections that are sure to please your palette! Part of the Hollywood Casino in Charles Town, West Virginia, the award-winning restaurant known as the Epic Buffet offers a discount to law enforcement personnel, first responders, active military, and veterans in an effort to thank them for their service. Open Tuesdays through Sundays, they offer a great buffet on Sundays, including a Pho bar. TopSpot Country Cookin’ & Catering in Sissonville, West Virginia, is country cooking at its best. The made from scratch menu items are just like Mom made, and TopSpot has been named among the “101 Unique Places to Dine in West Virginia.” Open every day except Monday, this great little eatery started as a hot dog stand in 1987, but was catapulted to popularity when their now-famous Chicken and Dumplings won the People’s Choice Award at the Taste of Charleston. Attentive servers and a focus on healthy eating make this restaurant a must-visit when you’re in the area. Featuring the best of Mediterranean and American cuisine, Ali Baba in Morgantown is a surprising blend of the two cultures and very popular with the locals. Open since 1978, hungry diners have been enjoying the unique dining experience that focuses on good food and great service. They offer an express lunch buffet Monday through Saturday that includes favorites like gyros, falafel, pita, Baba Ghannouj, fish and chicken specials, and more. If you want to know how to spell fresh, in Charleston, West Virginia, it’s spelled “Rio de Grill.” Offering lunch and dinner buffets every day of the week, they have an extension selected for kids and choices for those who prefer a vegetarian menu. The unique Brazilian menu has a popular salad bar served by friendly people. The Rio de Grill is definitely worth trying when you’re in the area. Great place—the sirloin is top knotch! If you’ve been looking for an authentic place for Indian food, the Spice Connexion in Martinsburg, West Virginia has what you want. Known for adding robust and intense flavors to food, Indian spices add a bold and innovative complexity to modern food. You’ll feel like you’ve traveled to a foreign country when you step inside the restaurant, and the lunch buffet served daily, except Monday, is a great way to sample a little bit of everything to discover your new favorite foods. Known as a local go-to restaurant for good Chinese food at reasonable prices, the Super Buffet in Elkins, West Virginia has all your favorite Asian foods from lo mien noodles, to fried wontons, egg rolls, beef and broccoli, and much more. There is plenty of variety for the whole family. Fresh, fast, and friendly. That’s how people describe Little India, in Charleston, West Virginia. Compared to noteworthy places as far away as California, Little India has menu items just as good if not better, like the Mango Chutney and Chicken Vindaloo, both available on the buffet. The restaurant has won numerous awards for their modern interpretation of classic Indian favorites.